When you cut a lot of steel you want a tool that can handle those tasks easily, but you may also want the portability that doesn’t demand a ton of fixed space in your shop. The Wellsaw 58B Metal Cutting Bandsaw is a good solution and is one of Wellsaw’s largest portable bandsaws. The Wellsaw 58B model offers the flexibility of both horizontal and vertical sawing, giving you options to cut more efficiently. The bandsaw’s power and flexibility allows it to be used for cutting a wide range of materials—including larger steel cross sections up to 6.5 x 11 inches. 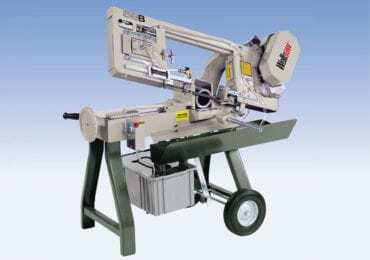 The Wellsaw 58B Metal Cutting Bandsaw is made in the USA and offers a single phase, 1/2 HP motor. Also, the Wellsaw 58B series has the options of wet cutting (58BW) or dry cutting (58BD). The wet cutting model offers a collection bucket at bottom and tubing to run water over the workpiece as you cut. Both models offer a full size gearbox and 3 cutting speeds for dealing with the different hardnesses of your work pieces. The Wellsaw 58B bandsaw features an adjustable stock stop, ball bearing blade guides, Baldor blade motor, blade brush, quick acting vise, replaceable pivot bar and bushings, and safety switch with overload protection. It also has a convenient auto shut-off at end of cut feature that senses when the bandsaw blade has made it through the material. For added stability and durability, the Wellsaw 58B metal cutting bandsaw is equipped with cast iron band wheels and a precision ground bed. The sturdy base is made from steel tubing and includes retractable wheels and a pull handle as well as a hydraulic feed control with adjustable counterbalance spring. Wellsaw manufactures a full line of high quality metal cutting bandsaws. Better still, all of their saws are made right at their factory in Southwestern Michigan. They also maintain their products—carrying a full inventory of parts for all models built since 1933—and most orders will ship the same day they are received. For more information about the company, and this USA–made bandsaw series, visit their website! Shipping Weights (58BD): 350 Lbs. Shipping Weights (58BW): 385 Lbs. One of our "crack" news editors at Pro Tool Reviews, Raissa Lograno gathers all the latest power tool, hand tool, accessory, and product info available and delivers it in a way that's fresh and easy to understand.